You won't find a more comfortable, relaxing mattress than one from Amerisleep. We carefully craft every part of our beds—from cover to core—to help you sleep deeper and wake up refreshed. We also use more clinically-tested and FDA-determined2 materials than any other brand. Our mattress cover uses Celliant® fabric. It has special fibers that the FDA determined promote more restful sleep2. They safely turn your body heat into infrared energy. When your skin and muscles absorb this energy, it increases local blood flow. And that helps you recover faster and wake up full of energy. Our Bio-Pur™ foam is five times more breathable, so you won't overheat. It also bounces back to its normal shape in seconds, so you'll never feel stuck if you change positions as you sleep. And because we make it partially from plants, it's better for the environment. It doesn't get the awful "memory foam smell," either. Our transition layer uses HIVE™ (Harnessing Intelligent Ventilation & Energy) Technology. Clinical studies show it reduces pressure points up to 49%3. The HIVE™ layer has five comfort zones containing hundreds of foam hexagons. We give them more room to expand in the shoulders and hips, where you need more cushion. And we move them closer together by your head, lower back, and feet where you need more support. Because every Amerisleep mattress comes with a 100-night, risk-free trial. If you aren’t completely satisfied, let us know within 100 nights. We’ll help you recycle or donate your mattress for free and give you a full refund. No strings attached. BEST SLEEP EVER!! No, but really!! Skeptical at first to buy a bed in a box! So glad i did though. So comfortable and literally the bed forms to my body. Like sleeping on a cloud! Best bed I’ve ever had hands down! I could never get a full night of sleep until I purchased this bed. It's been a blessing. 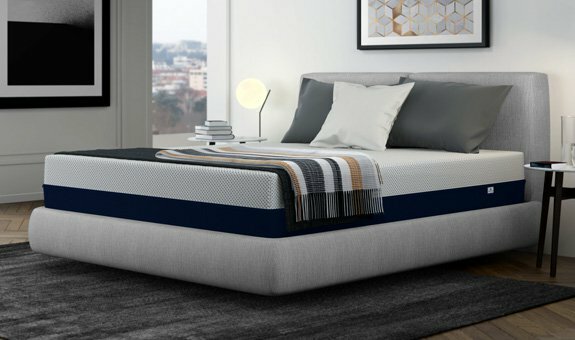 To sleep your best each night, you need a mattress that fits your personal sleep style. That's why we offer five different models that range from firm to soft. Visit our Phoenix showrooms and one of our sleep specialists will help you find the perfect bed. (And since they don't earn commissions, you will never feel pressure to buy). 1 The reviews have been pulled and averaged from Facebook, Yelp (across all Amerisleep locations), Google (across all Amerisleep locations), ResellerRatings, and the Amerisleep.com website (which verifies all submissions through PowerReviews). Updated June 24th, 2018. 4 Reviews. All featured customer reviews are unaltered. The comments made by customers are not intended as advertisements, and should be understood as the perspective of each individual based on their experience. These reviews should not be construed to mean that these experiences are universal or that results will always be the same.